Madden NFL 17 is an American football sports video game based on the National Football League and published by EA Sports for the PlayStation 4, PlayStation 3, Xbox One and Xbox 360. 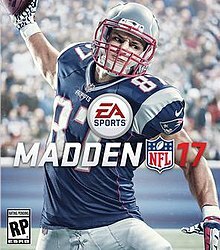 As the 28th installment of the Madden NFL series, the game was released on August 23, 2016 and features New England Patriots tight end Rob Gronkowski on the cover. It was the final Madden NFL game to be released on the PlayStation 3 and Xbox 360. On May 12, EA Sports uploaded a trailer to YouTube. They also revealed the new features that were added to the game, which include an upgrade of the Ground Game, a redesigned and better Franchise Mode, "Madden 365", new Ball Carrier UI Prompts help teach moves available to you, while the new Path Assist helps you navigate and anticipate down field and more. They have also announced that they would hire new announcers, Brandon Gaudin and Charles Davis. EA decided not to allow Madden players to vote for the Madden NFL 17 cover athlete, announcing it on May 12, 2016 via the SportsCenter Twitter account. After losing the Madden NFL 16 cover vote to New York Giants wide receiver Odell Beckham Jr., New England Patriots tight end Rob Gronkowski was announced as the cover athlete of Madden NFL 17. Madden NFL 17 has developed a new ground game mechanic that provide players a more balanced experience. In addition to this, the new defensive AI puts players' teammates into positions to stop the run or pass game. Features such as Ultimate Team and Franchise mode will make a return, however, many of their features have been revamped and upgraded. On August 3, 2016, EA Sports announced the soundtrack for the game, which would feature 40 songs, including 2 Chainz, Flume, Steve Aoki, Logic, Blake Shelton, Brantley Gilbert, Bishop Briggs, Flo Rida, Flux Pavilion, Pusha T and Lil' Wayne. The soundtrack was also made available for streaming on Spotify. The original score of Madden NFL 15 also returns in game and can be played through EA Trax. According to review aggregator Metacritic, Madden NFL 17 received generally favorable reviews. IGN awarded the game an 8.6/10, praising the improved franchise mode and defense, but were disappointed in the game's commentary. GamesRadar gave it 4/5, saying: "With major changes to some of the game’s core mechanics, and an impressive revamp of the now marquee Franchise Mode, Madden 17 has done its best to avoid [accusations of phoning it in and failing to make significant progress], and succeeded." According to the NPD Group, Madden NFL 17 was the best-selling retail game in the US in its month of release, but its launch month sales failed to surpass that of its predecessor, Madden NFL 16. ^ "Rob Gronkowski named cover athlete for Madden NFL 17". DenverPost.com. ^ "Madden NFL 17 - Features - EA SPORTS - Official Site". www.easports.com. Retrieved 2016-05-26. ^ "Madden NFL 17 Features Overview". www.easports.com. Retrieved 2016-05-15. ^ "Game on: Gronk gets cover of 'Madden NFL '17'". ESPN.com. Retrieved 2016-05-26. ^ "Madden NFL 17 Soundtrack". EA Sports. Electronic Arts Inc. August 3, 2016. Retrieved August 8, 2016. ^ "Madden 17-Xbox One". Metacritic. Retrieved August 22, 2016. ^ "Madden 17-PS4". Metacritic. Retrieved August 22, 2016. ^ "Madden NFL 17: Perfect Shouldn't Be The Enemy Of Good". Game Revolution. 2016-08-23. ^ "Madden NFL 17 Review". GamesRader. 2016-08-19. Retrieved 2014-08-20. ^ "Madden NFL 17 Review: Who You Callin' Special?". Game Revolution. 2016-08-19. Retrieved 2016-08-20. ^ "With a New Focus on Team Personality, Madden Makes a Return to Form". IGN. August 17, 2016. Retrieved August 17, 2016. ^ "Review: Madden NFL 17". Polygon. 2016-08-22. Retrieved August 23, 2016. ^ Grubb, Jeff (September 15, 2016). "August 2016 NPD: Madden, No Man's Sky lift summer game spending". VentureBeat. Retrieved September 17, 2016. This page was last edited on 5 March 2019, at 20:33 (UTC).